Our approach to food service is kid and family-friendly, customer-oriented, and accommodating for nearly any special dietary need. Food is served family-style, with each cabin group sitting together around a table. Family meals foster a sense of camaraderie within the cabin group, and allow time for cabin-mates to get to know each other. Meals are balanced, with fruits and vegetables readily available in addition to the main course. Some typical camp meals for summer camp and youth groups include grilled cheese sandwiches, spaghetti with meatballs, hot dogs, pizza, burritos, French toast, waffles, pancakes, scrambled eggs, barbecue chicken, pasta alfredo, chicken nuggets and more. A cereal bar is always available at breakfast, including yogurt, fruit, and oatmeal. Salad bar is frequently offered and fresh fruit is readily available at meals and for snacks in between. For picky eaters, “sun-butter” and jelly sandwiches are an option at any meal (sun-butter is a peanut butter alternative; we do not serve any peanut products). The kitchen staff can work with picky eaters to find something they will like, but kids will also be encouraged to try new foods. Camp Sealth is 100% peanut-free – we do not serve or allow any peanut products in camp; we check all the food served to ensure it was made in a peanut-free facility. We cannot guarantee that all food is free of all nuts; however, we can provide nut-free alternatives to those with allergies. Nearly all food allergies can be accommodated; the kitchen staff can prepare alternatives for any food being served. Vegetarian and vegan alternatives are regularly prepared and available for those who need it, as well as dairy-free options. Options that do not contain gluten are available, however, we are not a gluten-free establishment. 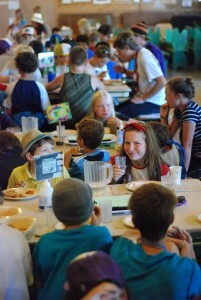 Camp Sealth offers a week of summer camp for kids who are gluten-free, with meals prepared by the Gluten Intolerance Group. Camp Sealth can accommodate most special diets, however, we cannot accommodate extreme, weight-loss, or strict Kosher diets. In order for us to serve you best, contact the Food Service Manager at 206 463 3174, ext. 25 with questions.